Don't be angry with me for arriving out of the blue. I've given it so much thought and I'm sure we'll gain time this way. Shall be at the Louvre from midday onwards, or earlier if you like. Please let me know what time you can get to the Salle Carrée. As far as expenses are concerned, I repeat that it won't make much difference. I still have some money left, of course, and I want to talk to you before spending any of it. We'll sort everything out, you'll see. Vincent van Gogh. Letter to Theo van Gogh. 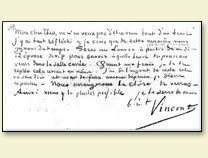 Written c. 1 March 1886 in Paris. Translated by Robert Harrison, edited by Robert Harrison, number 459.